Former head of state of the Republic of Sierra Leone – Julius Maada Bio, and his wife Fatima Bio are focussing attention on the needs of vulnerable groups in Sierra Leone, as poverty continues to rise. They have established a foundation that will provide assistance and various support for children, women and youths throughout the country. 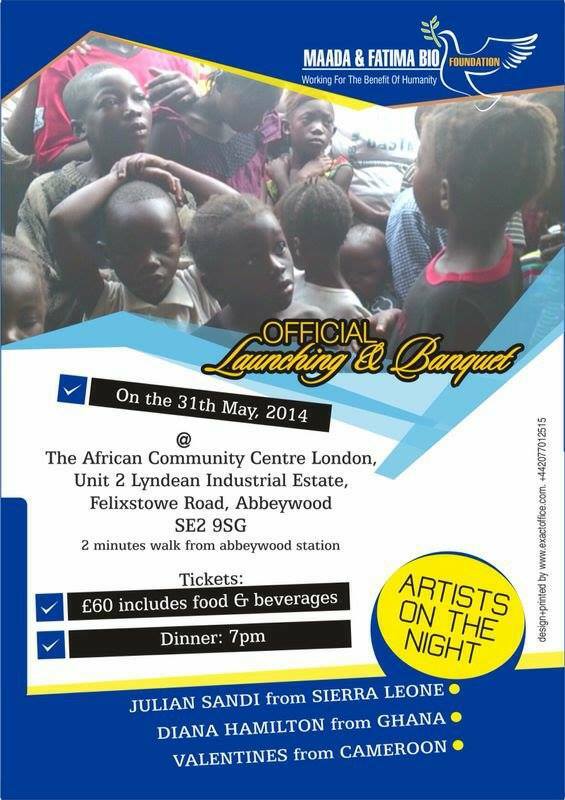 The foundation will be launched on Saturday, May 31st 2014, at the African Community Centre in South East London. Speaking about the foundation, Retired Brigadier Julius Maada Bio said that the launching of the foundation, represents his belief that as citizens, we all have a duty to one another – where we can, to provide assistance to children, women and young people who are faced with many challenges in our communities and society at large. He said that there are many well-meaning Sierra Leoneans living at home and abroad, who do many remarkable things to help vulnerable children, women, young people and communities. We should recognise the good works and generousity of Sierra Leoneans who are providing various forms of support to help others, and be grateful to them as a country, said Bio. 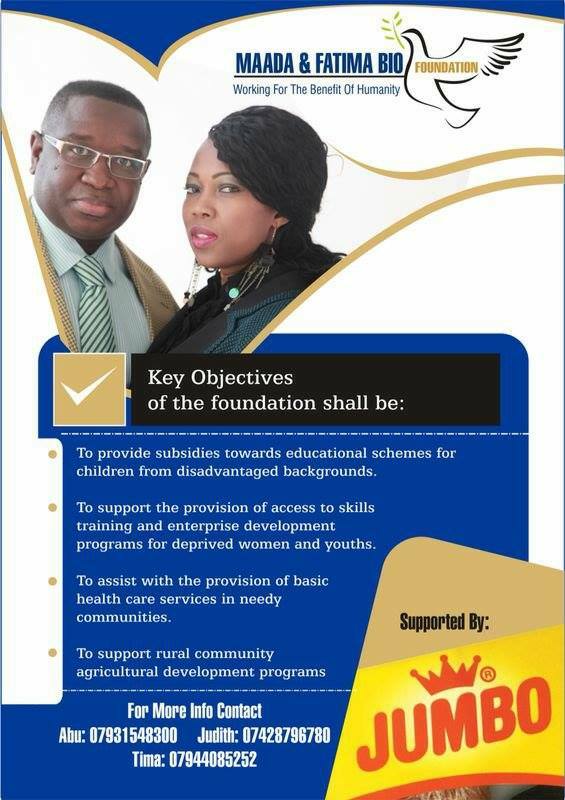 “This Foundation is not about politics; rather it is just a part of our civic responsibility as citizens to ensure we provide a conveyance through which children, women, youths and communities will be supported by various interventions”, Julius Maada Bio added. Providing subsidies towards educational schemes for children from disadvantaged background; Supporting the provision of access to skills training and enterprise development; Assisting with the provision of basic healthcare services in needy communities; and Supporting rural community agricultural development. The launching of the foundation is expected to be honoured by many Sierra Leoneans in the United Kingdom, Europe and other parts of the world. Also, several foreign nationals, the international press, politicians and diplomats will attend the launching ceremony, which will be followed by a banquet. Tickets for the launching of the foundation and banquet are priced at £60. All donations and fundraising will go towards achieving the objectives of the foundation, which is geared towards helping vulnerable children, women and young people achieve their aspirations. Also, during the launching and banquet, there will be performances from various artists from Sierra Leone, Ghana and Cameroon. The MC for the occasion is UK based Sierra Leonean stand-up comedy genius – Tommy Massaquoi. In February last year, former President Olusegun Obasanjo launched his foundation in London, which is geared towards supporting youth empowerment, girl child initiatives, and health care in Nigeria. The launching of the Julius Maada Bio Foundation will coincide with Bio’s 50th birthday this May. Information about the launching of the foundation and tickets can be obtained from: Abu: Tel. 044(0)7931548300; Judith: Tel. 0044(0)7428796780; Tima: Tel. 0044(0)7944085252. Thanks and appreciation for this Foundation which is helping the less privileged in Sierra Leone.